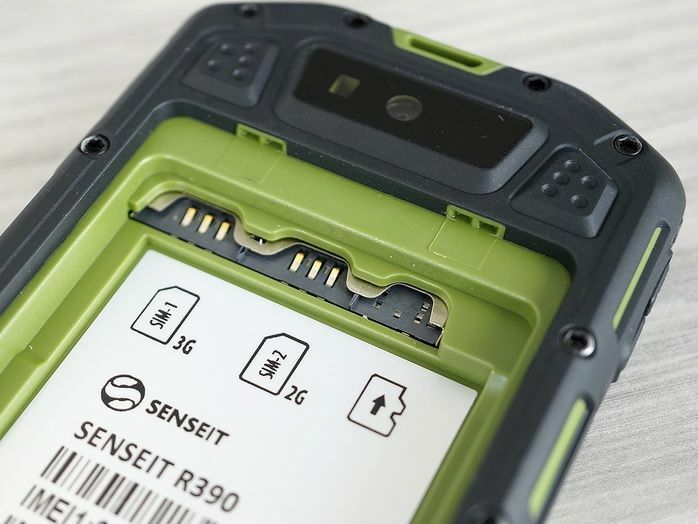 SENSEIT R390 – Safer smartphone with the highest of manufactured devices (at the moment) protection class IP68. Dust and waterproof – its harsh appearance suggests that it is designed only for extreme conditions. 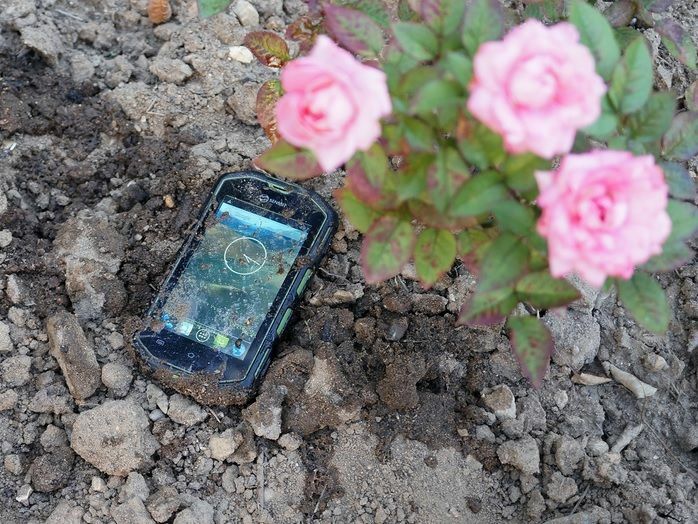 However, before you buy into his “brutality”, should evaluate his “inner world” and see how a loyal friend, this smartphone will be in a difficult journey. 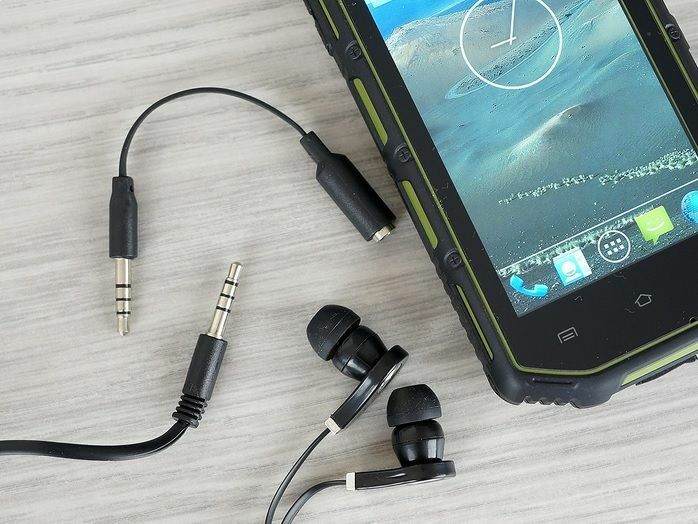 The set includes, in addition to the smartphone, power adapter, cable Micro-USB, wired stereo headset, headphone adapter, portable screwdriver, protective film, already glued to the screen, warranty card and instruction manual. All this is packed into a small compact box. 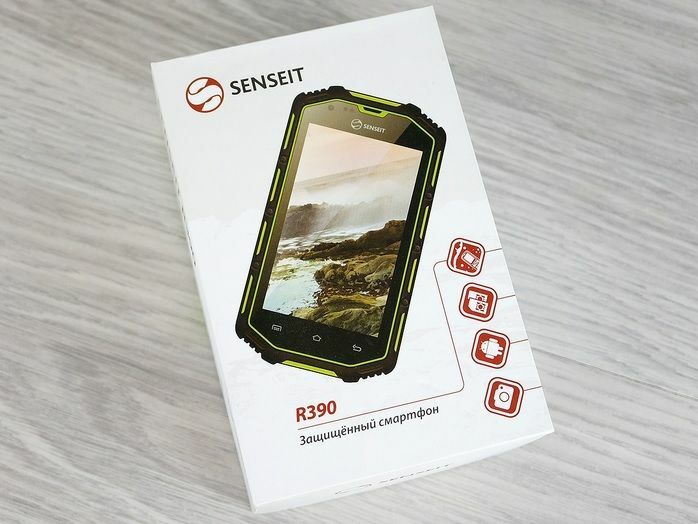 SENSEIT R390 – impressive size smartphone form factor of the classical candy bar. The main part of the front surface covers the touch screen. Under it are three touch-sensitive Android-buttons above the display – the manufacturer’s logo, the front camera lens and earpiece. On the left side from the top there are two volume keys. On the right side on top is the power button / lock, bottom – the start button of the camera. Located on the bottom connector Micro-USB, tightly covered plastikatovoy stub. 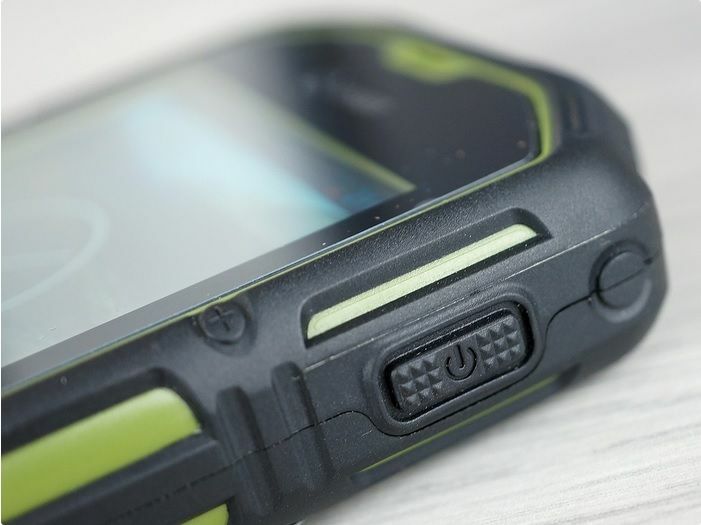 At the top end – 3.5 mm audio jack is also covered with a flap. Along the perimeter of the back surface located fourteen bolts fastening the body. From above, in a small window covered with transparent plastic, ramescheny main camera and LED flash. 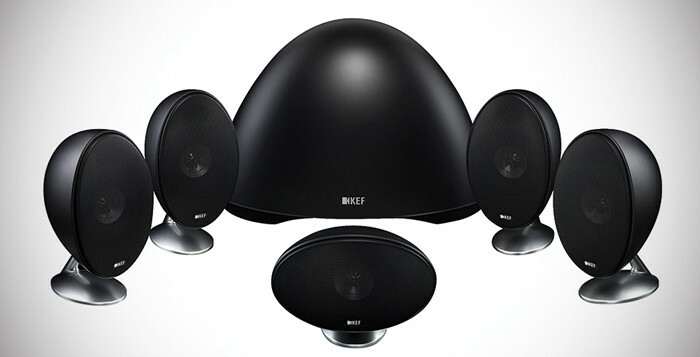 Bottom – the external speaker and two large bolts that secure the rear cover. 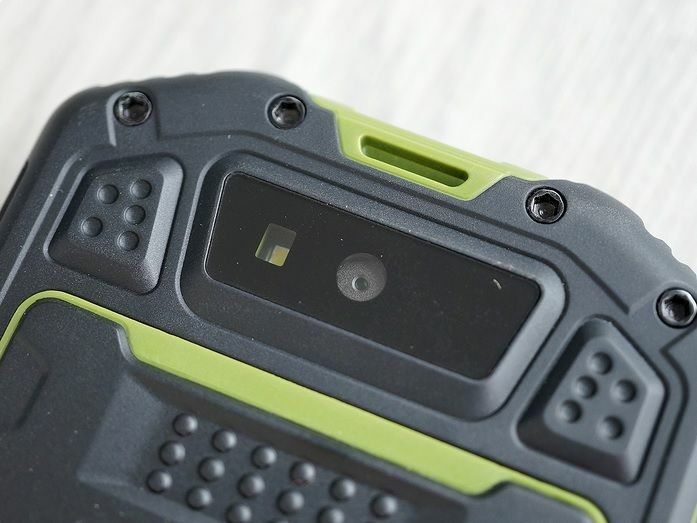 On the cover, bordered in green plastic, is the manufacturer’s logo, print a certificate of protection IP68 and four small icons embossed with the advantages of the smartphone. 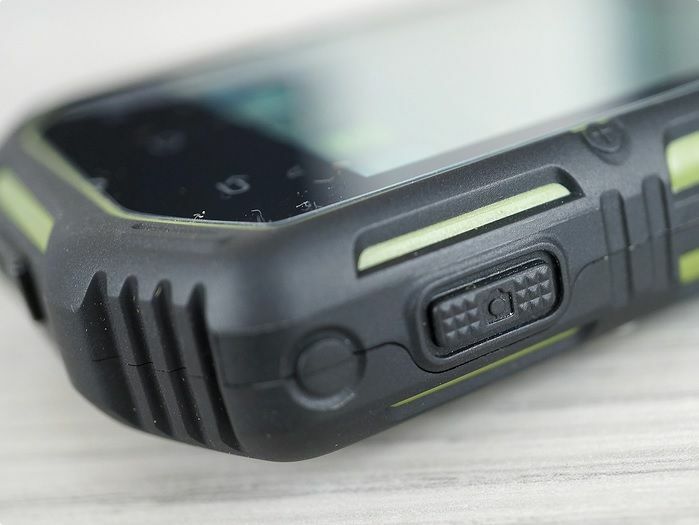 Under the cover of “quartered” battery, two slots for full-size SIM-cards and cards MicroSD. “Hot” replacement cards are not – in any case you need to get the battery. However, it is also a tribute to the highest degree of protection: the smaller the holes in the body, the more reliable. The smartphone is sold in two colors: black with orange trim and black with green accents. The device looks impressive: the size is convenient only for a man’s hand, the weight of 210 grams significantly delayed the pocket. To build quality is difficult to find fault – check it for scratches when twisting the two hands is not possible, because this “brick” bend under force unless the blacksmith or weightlifter. Plastikatovye plug connectors are tightly closed, and screwed on the bolts back cover reliably protects the battery from water and dust. 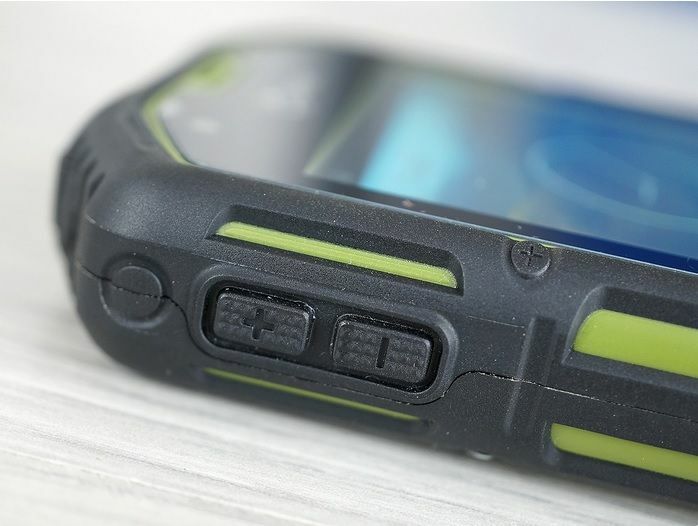 To unscrew the screws, do not necessarily carry a screwdriver: they are easily unscrewed a coin or a key (or edge stems sleeve 7.62 – who knows where this is useful to you phone). All connectors are deeply recessed, so unit requires special accessories with elongated connectors. If for any standard headphones supplied adapter is present, then a micro-USB cable from the kit will need to be treated very carefully and do not leave, anywhere. If you lose, find similar in the sale will not be easy. Plug something in his standard, but the usual connector just does not make it to the contacts. Reinforced frame with extra lining absorbs well in the fall. All the buttons are pretty tight: to their press, to be exerted tangible efforts. For even greater reliability phone lacks the physical call button, which can be saved if the touchscreen fail. But the big screen seems a weak point in device, whose fate – to soak in the rain and all the elements to fight on par with his master. 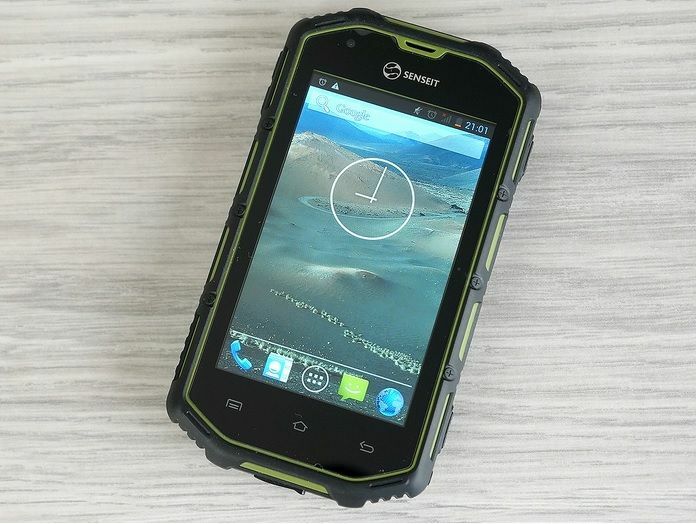 SENSEIT R390 received chetyrёhdyuymovy display with TFT-matrix and WVGA-resolution of 800×480 pixels. Now even budget devices often have a screen with a higher resolution, but for secure models is good performance. The capacitive sensor of the display takes no more than two simultaneous keystrokes. Responsiveness and sensitivity of the sensor is not satisfactory. The smartphone is equipped with a light sensor that will save a couple of percent of the battery load automatically determine the brightness of the display. The viewing angles are quite good, but the sun screen “fades” – you have to put the maximum brightness and look comfortable angle that will work comfortably. In general, the screen quality is not different from most screens cost smartphones. Yet recall that device – “SUV”, and for this category of devices there are specific standards. Judging by the manufacturer already glued to the screen protective film, talk of a oleophobic and anti-reflective coating is not necessary. That, again, the lack of will not name. SENSEIT R390 running Android 4.2 Jelly Bean, which every day becomes obsolete, but, thanks to the already familiar interface, unpretentious friendly to the user. 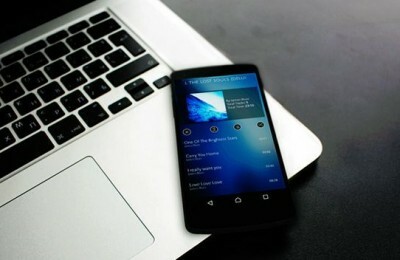 The smartphone has a standard interface “naked” Android. From a set of pre-installed applications, you can select only “Mobitreker.” “Mobitreker” – developed by SENSEIT application that helps to interact with the service GPS-monitoring Mobi Track. 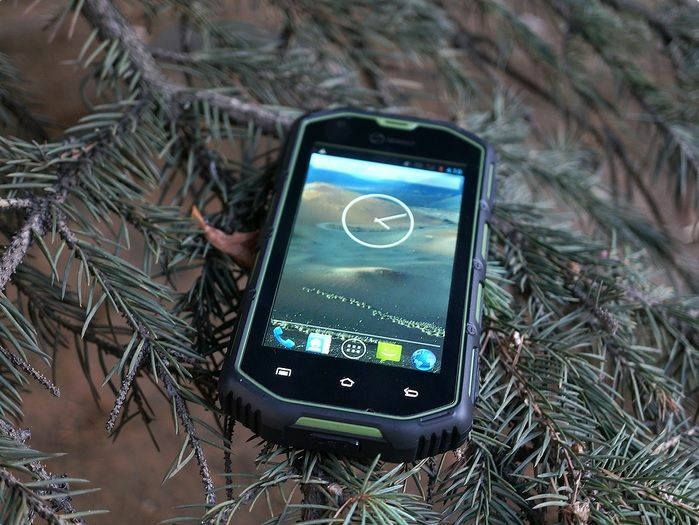 Built-in GPS-module every five minutes (can be customized) determines the position of the phone, turning it into a full-fledged tracker. Free subscription to the tracker is limited by function, however, and it is enough for the extreme case. 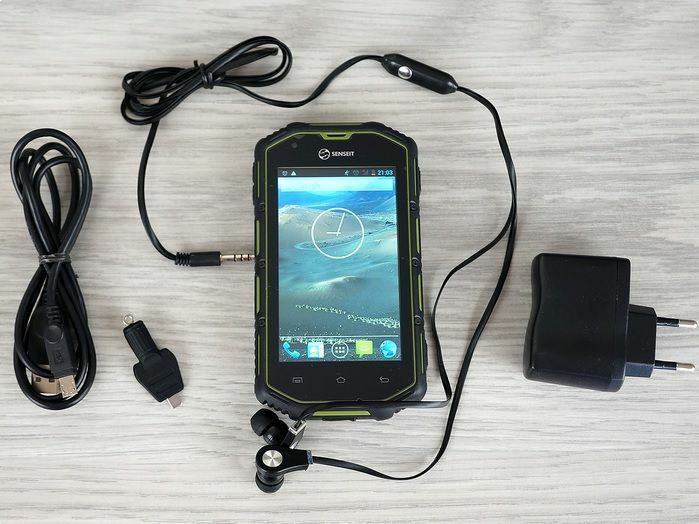 Gasket and route tracking user configurable Geofence function, at the border which is served notification, can be very useful for travelers and hunters, and even for the military. The free subscription notification comes to e-mail, and paid – for a predetermined phone number (including your own user number). Tracker allows you to build a history of the route, display the time and place of pressing SOS. The application has a large number of cards, so that you can travel with your phone all over the world. On “cold” start tracker takes about 5-7 minutes. Then he works with preset interval. 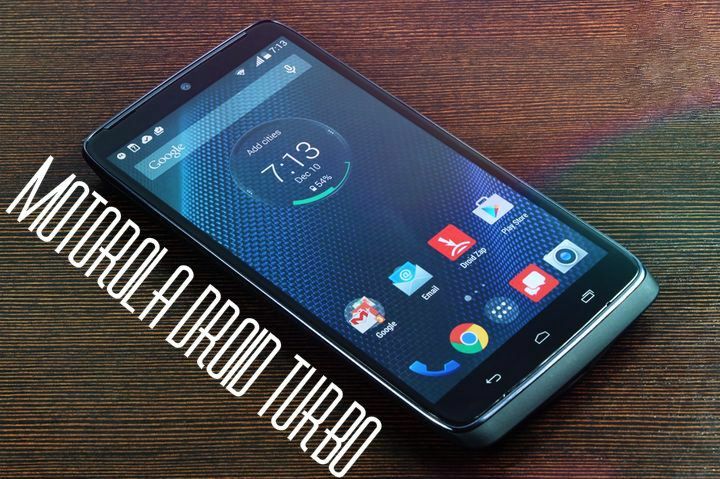 Work provides a dual-core processor smartphone MediaTek MT6572A clocked at 1.2 GHz. Amount of RAM is 512 MB, which by today’s standards is considered insufficient, but for a particular device is acceptable. Built-in memory of 4 GB, of which less than half is available for user needs. 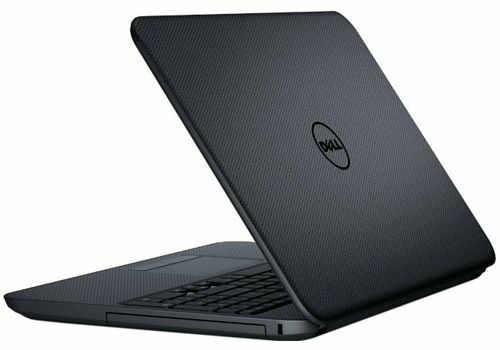 CPU power is sufficient for the normal operation of the interface: smooth flipping desktops and menu pages, clear the screen auto rotate, zoom in the gallery and in the browser without jerks. With the “heavy” 3D-games, he also manages: Dead Trigger 2 and Minion Rush work without the “loose” and with minimal loss of personnel. The two-dimensional games, like Angry Birds and Cut the Rope 2 go at all without the slightest problem. 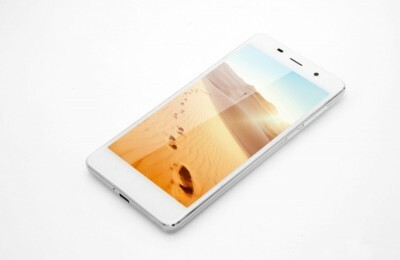 During the game, the smartphone is very hot, and not from the battery, and from the front. 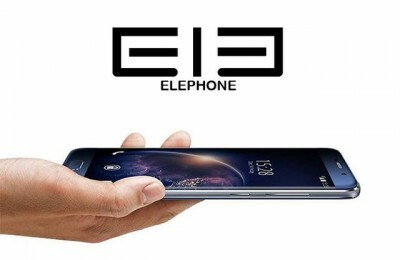 Benchmark AnTuTu put smartphone’s performance rating of “Good”, estimating it to 11,091 points. Graphics benchmark 3D Mark tests refused to run due to a lack of RAM. The earpiece is loud enough: a telephone conversation does not cause any discomfort. 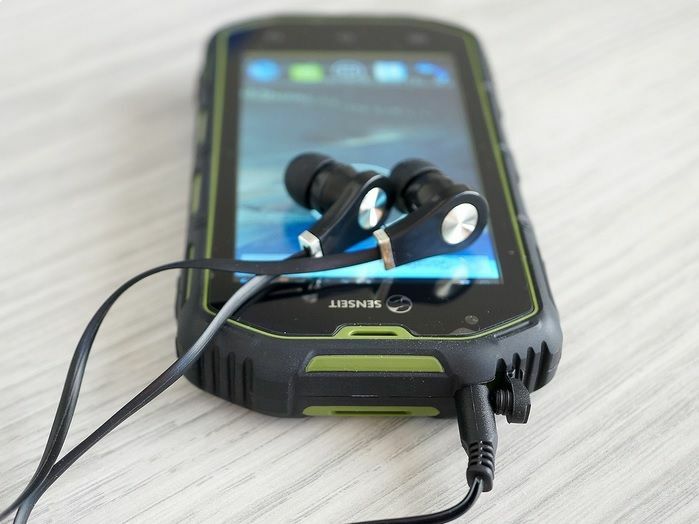 External speaker also has a good stock volume: hear, even if the unit will be on the bottom of the backpack. Headphones out of the box quality not hit. Despite the fact that it is not cheap “ear” (greetings from the 90’s), which rarely have to meet, and vacuum “droplets”, the sound of them fuzzy, nedetalizirovanny, has a lot of extraneous noise. The most appropriate word for this sound – “dirty”. However, as a headset they quite amiss. We should also talk about the protective properties of the smartphone. 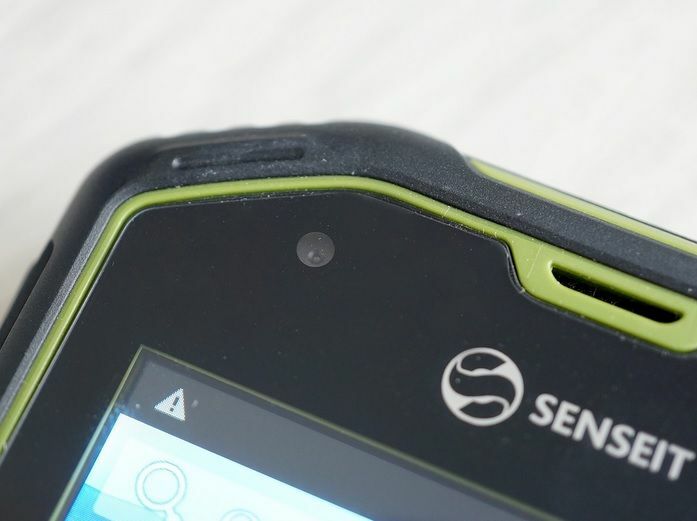 SENSEIT R390 received a certificate of protection IP68 (maximum index of protection – IP69), which means that it is completely dust-tight and protected against water immersion to a depth of more than a meter for a long time. Test the water in practice the phone went dignity: after a 20 minute dive to the bottom of the bath completely preserved performance, which did not lose and under water. However, under water sensor does not work (yet another argument in favor of the buttons), but turn on the camera and make a couple of underwater shots available. Speaking of pictures. 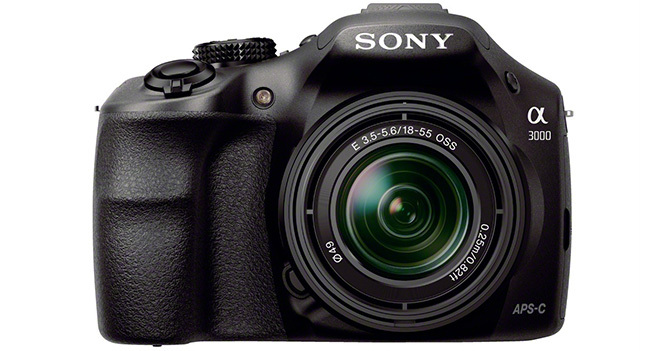 The device is equipped with a fairly low cost camera module with a resolution of 5 megapixels. Resolution of the front camera – 0.3 megapixel. The main camera has a flash and autofocus. At its launch takes about two seconds. Quality is average – for those who like to photograph the sights and funny moments of his travels, it is hardly suitable. But the role of the device for a “technical fix” frames (when the content is more important than form) module copes. Again, do not forget about underwater photography. The camera has a simple and familiar to the “naked» Android interface. Set of modes is limited panoramic shooting, HDR and smile detection. Flash odnodiodnaya, and as a flashlight will be able to highlight only way underfoot – a beam of concentrated light diverges no further two meters. 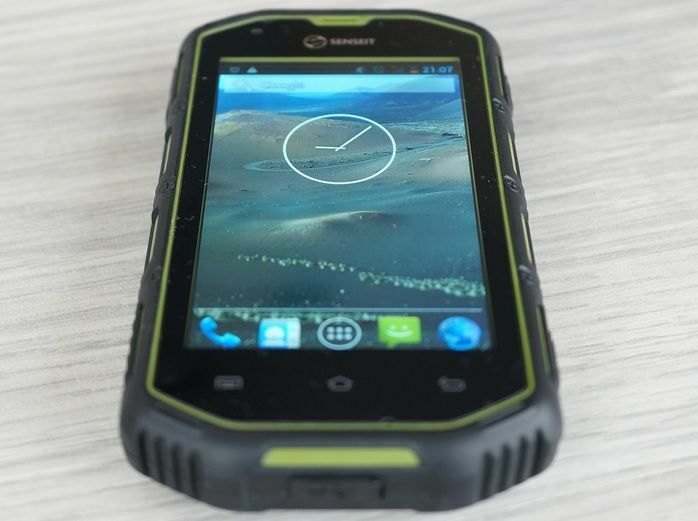 The smartphone is equipped with a standard set of wireless interfaces: a tri-band Wi-Fi and Bluetooth 3.0. Their work will have no complaints. Two SIM-cards operate in a Dual Standby: an appointment with both active SIM-card while talking – only one. Launch and find communication with the satellite in GPS-module takes about two minutes. 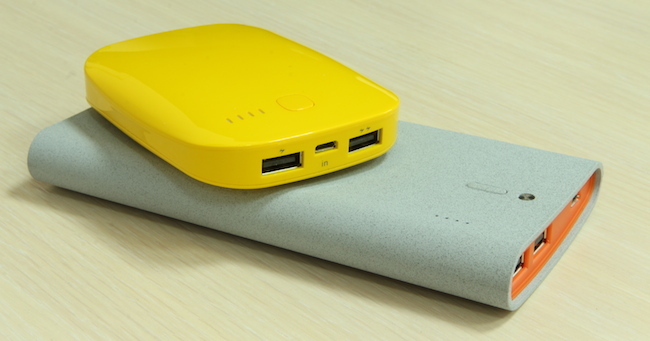 The smartphone has a battery capacity of 2400 mAh. Not the most impressive figure for the number category off-road. Although it would seem, the manufacturer cost and sacrifice performance, and to increase the screen size of this vital measure. The manufacturer claims 850 hours (35 days) of standby time and 8 hours of talk time. 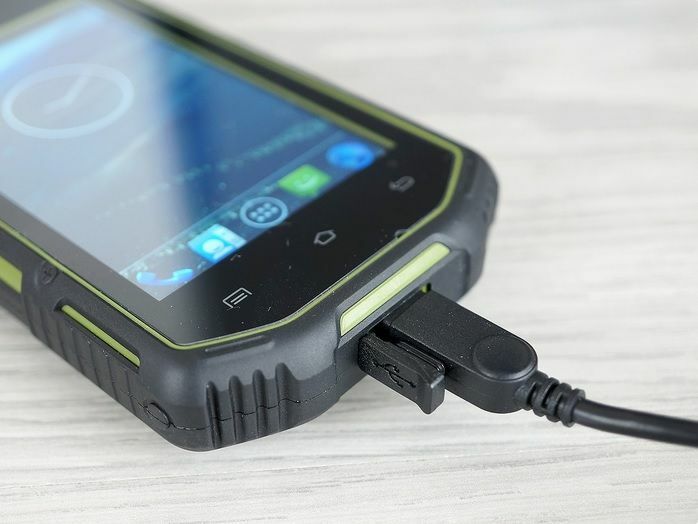 Indeed, when the smartphone is just lying on the table, the battery is reduced it is much slower than that of conventional Android-smartphone that spend the charge in standby mode as if they have three SIM-card in a constant search for the network. However, using the phone as a daily (ie, the included Wi-Fi, full brightness, internet, games, music) manages to put the battery nearly as fast as most minimally protected counterparts. AnTuTu Battery Test set smartphone rating of 4152 points, which is not much distinguishes it even against simple Android-smartphone. On a full charge the device requires a little less than four hours. Hour of playing Dead Trigger 2 at full brightness with the included Wi-Fi izvёl 25% charge. 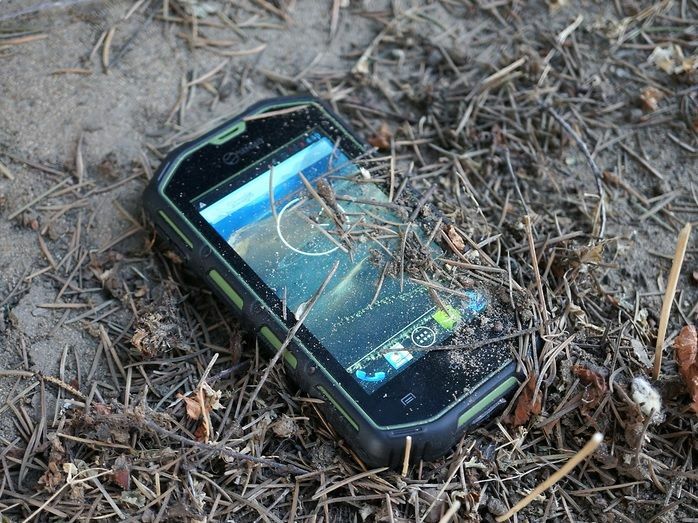 Hour GPS-tracking when enabled Wi-Fi “eats” 3% of the battery, which suggests that in the field solely as a tracker smartphone will not last longer than two days. One could stop here, but let me remark. Battery devaysa – replaceable. Consequently, those who intend to take it with you camping, and all you need to attend to that purchase replacement batteries. And do not forget to override gluttonous module Wi-Fi, as well as data transfer over GPRS / 3G – where these networks is not there. Then, perhaps, a resource and that’s enough for a week’s autonomy. SENSEIT R390 turned out pretty balanced device with a set of both pluses and minuses. If we draw an analogy road, we have a real SUV, not a “SUV”. They really can be if you do not hammer nails, then at least to defend themselves against the enemy. The budget also filling should not scare off travelers who are unlikely to “drive” in Asphalt 8 at rest. It can be done even more for the sake of budget and battery life. The second factor, which is protected smartphone must not only attract and surprise – it’s battery life. SENSEIT R390 surprise could not, although the index it clearly above average. 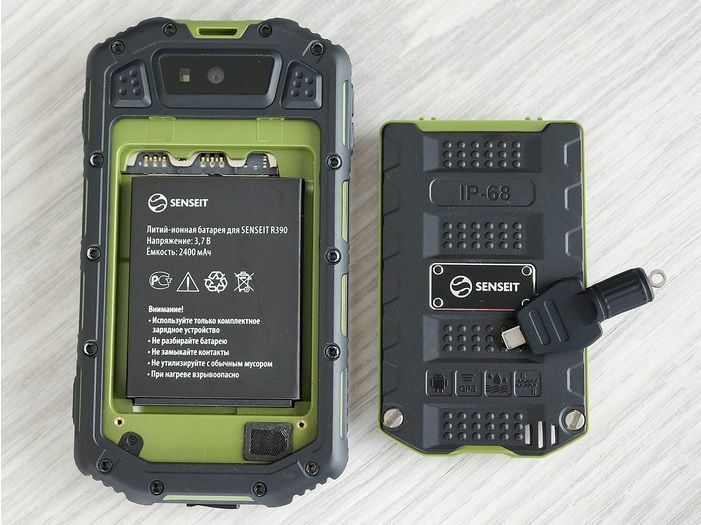 Attract new product can integrated GPS-tracker and price $ 215 as of “off-road” with similar characteristics SENSEIT R390 – one of the most affordable. impressive dimensions of the body.